The sun was warm on his face as Lask rode the wind. After waking, and pulling on something to ward off the upper clouds’ chill, he leapt from his balcony and thrust himself upward toward morning. He glided over the island, banking and somersaulting in the air, the wind carrying him high toward the sun, before he embraced himself in his wings and fell back toward the island. He closed his eyes, relishing the wind on his face, before he flared his wings with a thrum of rushing feathers, and soared out toward the western point of the island. As he neared the bridge, he noticed things looked amiss at the gate. Tucking his wings, he swooped in to land on the bridge, crossing the rest of the way on foot. 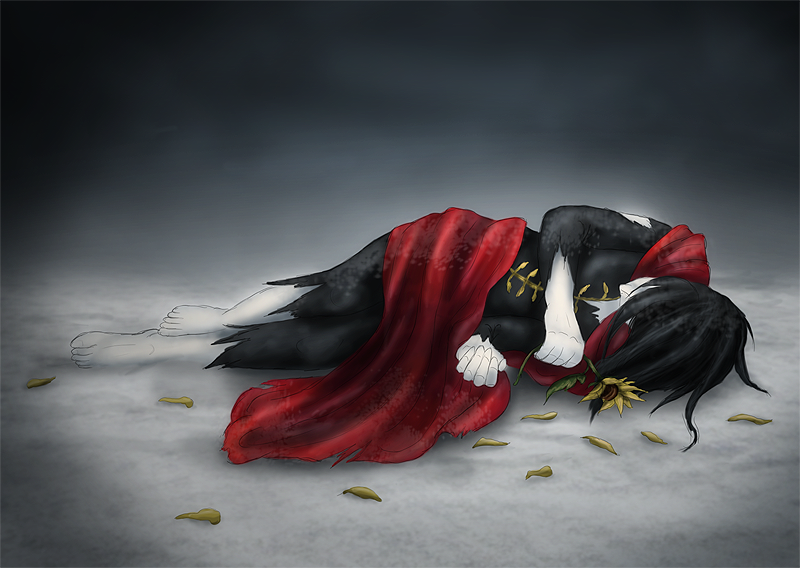 His long crimson feathers trailed behind him, rustling softly like the echo of a concerned whisper against the stone. As he neared the gate, he decided something must have collided with it, if only the wind, for some of the bars were bent and several hinge pins had been jostled loose. His brow furrowed and looked out into the mainland beyond. Nothing else seemed out of place, and it felt as though the wards of his gate were intact. There had been some gusty winds across the river in the night; perhaps they had blown the hinges askew. Returning to the sky, Lask flew back across the river and over the trees. He banked over the forest, gliding to the top of the tallest tree on the island, where he came to land on the west balcony of his home. He ruffled his feathers, setting them alight with his fire, then furled his wings around himself. They seemed to sink into him, disappearing until he resembled an ordinary man. Lask went inside to rummaged through one of the cabinet for his bag of tools, looping the strap over his arm. Having gotten what he needed, he returned to the balcony and sprang off toward the tree tops. Fires flared around him as his wings reappeared, unfurling midair to send him soaring back over the trees. He landed on the mainland just outside the gate, and knelt to pick up the fallen hinge pins. Clutching them in one hand, he rooted through the bag for a hammer. He stood, aligned the first of them, and started knocking it back into place. When he heard the first sound, he mistook it for the noise of the hammer striking metal. When the sound came again, he knew it was nothing he had done. Lask glanced over his shoulder, and was swept with a sudden jolt of panic. Six Dark Runners were barreling out of the trees– lanky skeletal beasts, with razor beaks. A dozen Warmongers, hulking with muscle like wolves or hyenas, close behind them. Lask didn’t have time to leap back into the air. The first of the Runners collided with him at full speed, slamming him into the gate in a tangle of legs and feathers. The magic of the gate zapped the Runner, blasting it back, but the others had closed in. Lask dodged a stabbing beak and swung with the hammer. It collapsed the skull of the Runner in one swift blow. He cursed himself for not pausing to collect his sword. A Warmonger’s teeth closed over his arm, and Lask kicked it. The enemies were everywhere. He could hardly see for the swarm of Dark creatures teeming around him. He distantly wondered how long they had waited to lure him outside. Feathers flew everywhere; Lask could feel claws, teeth, and beaks tearing at him on all sides. He blazed with fire, singeing everything that touched him, and lashed out at anything he could reach. His fist collided with snarling faces at every turn. His feet bludgeoned hideous bodies. He strained and flailed against them, needing only to get back to the sky. In the chaos, he hadn’t seen the Demon come up behind him. The knife bit into his right wing, and Lask flailed, buffeting his attacker, who continued to hack at his back. The knife blade was simply not long enough to pierce through the thick mass of his wings and into his body. Lask could hear himself screaming, but he was like an animal– impervious to the pain in the coursing rush to survive. He could hear something tearing. The Warmongers were yanking at his wings, fastening their teeth in, trying expose his back for the Demon’s poisoned knife. They will kill you! his mind shouted at himself. In that instant he saw a flash of faces– Elanor, Jackie. If you die too, they will both be alone! Lask struggled like a mad beast, roaring, blazing, but there were too many. They were trying to get him to the ground, where he knew it would all be over. He could feel the knife slicing behind him, could feel the Warmongers tearing at him, the Runners kicking, stabbing with their razor beaks. You are going to die! his mind screamed. You MUST get free! NOW! Lask could feel his heart hammering against his ribs as sheer panic overtook him. It was like he could see nothing but terror, agony, blood, and Darkness. With a thunderous roar, he flung himself to the side, a great fireball burst out from him. Their grips faltered for just a moment, and Lask took the only chance he saw. He flung himself off the cliff behind him, toppling over the edge of the mainland, seeing his attackers shrink away above him. He strained, flaring his wings, and was halfway down when he realized they would not hold him. He hit the water with a force that nearly knocked the wind out of him, and his own blood burst in a scarlet plume around him. The touch of the water seared his wounds, and he was nearly lost in the agony. He did not know where he found the strength, but he hauled himself back to the surface against the current, throwing his arms around a rock at the base of the cliff face. Looking up with hazy eyes, he could see his attackers moving away. They could not pursue him into the Light river, and he could tell from their leering faces they thought he was as good as dead. Lask slumped against the rock, gasping huge lungfuls of air. Glancing to the left, he could see the river pulling a steady trail of blood away from him. Don’t look, he thought. You don’t need to know how bad it is now. He hung on the rock for a few seconds more, trying to muster what strength was left in him, then reached up, getting a handhold on the side of the cliff, and hauled himself out of the water. His wings stirred fruitlessly behind him. He was trapped; the only way out of the river was to climb. Steeling himself, he found a foothold and began the ascent. Every movement was torture. His body screamed with the pain of a hundred wounds, but he grit his teeth until the inside of his mouth bled, and pulled himself upward. He had to be back in Avigdell by nightfall. He did not know how many hours were left, nor how much more he could stand to bleed, but he knew he could not afford to take the slow pace he wanted. He forced himself upward, leaving a trail of blood and tattered feathers, like a war-tossed Icarus. When he finally made it to the top, he paused, just peering over the edge. No sign of his attackers remained excepted their fleeing black footprints. They had done their work well, and hadn’t bothered to wait around. They knew he was dead. The thought frightened him, but he did not linger on it. Lask hauled himself over the edge, onto the bloody grass beside the gate and fumbled for his key. For a brief heart-jolting moment, he thought he had lost it, but found it tangled in the tatters of his shirt, and unlocked the gate. He fell onto the bridge beyond, but righted himself, bracing a shoulder against the gate to push it closed. There was a ripple of magic over it as it sealed again. He sagged against the rail of the bridge, and saw a steady patter of blood drip onto it. He did not have the luxury of rest. Forcing himself back into motion, he pulled himself along the bridge rail, stumbling the length of it back to the island. He climbed the path up to the trees. The wind rustled in the leaves above him, and he leaned against the nearest trunk, panting, closing his eyes for a moment. Everything hurt. It was as if he had become a walking ember of agony. Gritting his teeth again, he rolled away from the tree and staggered into the forest. The sun was beginning to sink into evening behind him as he labored back toward his home. He did not know what he was going to do when he got there. His cottage was high off the ground at the top of a tree with no low branches for climbing. All his supplies would be high out of reach. He didn’t dwell on it, deciding he would figure out something if he survived long enough to get there. When he at last reached the tree, he saw a small building had appeared below it. There was a faint flicker of a smile on his bloodied lips when he saw how the island provided for him. He stumbled to the door and let himself in. It was an infirmary of sorts, with rags, bandages, and bowls of cleansing solutions already laid out for him. He pulled the stool close to the counter and collapsed onto it. Reaching for one of the rags, he began cleaning himself up. It was a long process. He filled bowl upon bowl with bloody water, and used many lengths of bandage. He lost count of his injuries, but marveled distantly that he had survived long enough to make it home. Several Runner beaks had pierced deep into his sides, but somehow just missed anything vital. The salves and medicines stung like hornets, but he rubbed them on anyway. When he had tended his battered body, he turned his attention to his wings. Craning his head, he could see the ragged edges of them over his shoulders. Feathers and flesh hung like dead leaves. He couldn’t tell the extent of the damage, but noticed a full length mirror in the corner of the room. He held the counter in a death grip as he pulled himself up and staggered to the mirror. The sight sent a wave of horror through him. For a moment, he thought he might vomit. There was little left of his right wing. Much of it had been torn off entirely. Bone dangled freely at thigh-level. Flesh hung in strips under his shoulder. His left wing was not much better. It had been sliced to shreds by the Demon’s knife; feathers and skin were torn and rumpled like discarded paper. Even worse, every place the knife had struck was black. The poison was spreading through his wings, causing the flesh to rot around each of the wounds. For a time, Lask could only stare in dismay. No amount of medicine could heal this. Magic would be his only prayer, but he did not know what sort. A light flickered on the edge of his vision, drawing his attention. Turning his eyes to the darkening window, he saw a lantern had appeared on the tree outside, illuminating a door in the trunk. Inscribed on it was the word Elbariel. Lask did not know if he would be strong enough to safely manage accessing the Library, but decided if the door had appeared, the Library must want him to visit. Turning from the mirror, Lask limped out of the infirmary and approached the door. He was distinctly aware now of the tatters of his wings hanging behind him. He slipped his key into the lock, and opened the door. Light streamed out to meet him, and he blinked in the sudden brightness. He passed into the Library, approaching his podium to slump against it. “Elbariel,” he called, and his voice broke. An upholstered stool appeared behind him and he sank onto it with a grateful groan. A faint warm breeze stirred against his face. There was a flash of light out in the distance, and two books glided out of the expanse to land in his lap. Lask opened the first one. “Where should I look?” he asked. Velserka was a Demon with the Sight. With it, she foresaw the formation of Alkesh Alushain, and set out to foil it. She approached her old ally Zestir first, but he refused her, unwilling to waste time and resources on an uncertain future. As time passed, Zestir hired other seers, who also told him the danger the Alkesh would pose to him, and he decided Velserka had been right to act. Lask stopped reading and set the book aside. He knew well where their plans had led. He opened the second book, and again asked the Library where to look. When the pages settled, he began reading again. Lask was created with gift of regeneration. The power lay dormant inside him until he was attacked by Zestir. He was then presented with a choice that all regenerative spirits must make: to manifest the power internally or externally. If directed inward, a spirit will be able to regenerate nigh any damage done to his form. These spirits can regrow or reattach limbs, heal broken bones in minutes, and myriad other advanced healing procedures. If directed outwardly, a regenerative spirit can perform this magic for others, healing deadly wounds, restoring limbs, sight, and other senses. While a regenerative spirit will always have keener healing abilities than the average spirit, the nature of the regenerative power cannot function both ways. Once manifested, the power will remain set until the spirit’s death. The poison spreads in Lask’s wings. In four hours, it will reach his chest. An hour later, it will reach his heart, and Lask will die. There are currently no healing procedures which could be conducted in the next five hours powerful enough to cure the poison. “What can I do?” he whispered, though he feared he already knew the answer. To save his life, Lask’s wings must be amputated, the Library replied. Lask closed his eyes, but the tear broke through anyway. It spotted the open page in his lap. He closed the book, and nodded. He forced himself up from the chair with a pained grunt, and limped out of the Library, feeling its warm breeze on his tattered back. The door shut behind him, and he stood for a moment in the shadows of the trees. Night had fallen, but lamps lit the infirmary. He went back inside, approaching the counter. He opened the top drawer; inside gleamed an array of finely honed knives, picks and saws. His jaw clenched, and if it had been possible for his complexion to pale, he surely would have. He gathered up an armful of rags, and selected his instruments. Going back to the mirror, he set the blades down on the table in front of him. He turned his head, for a moment studying the remains of what had once been a beautiful wingspan. Tears streamed freely down his face, but he made no sound. He reached for the table and took up the first of the blades. He would start with the right one. He growled as he stretched, countless wounds pulling under the bandages. He gripped the top of his wing in his right hand, and moved in with blade. His breath rushed out of him as the knife sliced into flesh. He forced his eyes back open, locking his gaze on the mirror to see his work. He cut through the base of the wing, breath coming in gasps, until he hit bone. The flare of agony drew a sharp cry from him. Steeling himself, Lask exchanged the knife for one of the saws. He pushed it through the severed flesh to rest against the bone at his shoulder. He drew it down in the first stroke, drawing another cry from himself. He tried to work quickly, but his hands shook, and tears blurred his vision until he could barely see his reflection. He felt himself trembling, as if he were no more than a leaf, and his legs suddenly buckled under him as his vision went foggy. Lask collapsed in front of the mirror with a ragged cry. He was alone. He had to manage. There was a flutter of wings nearby, and his familiar hawk, Aleva, landed on the windowsill with a concerned call. Lask ignored her and regained his grip on the saw. He wept freely as he pulled it, grating through the bone, but he shook like a stalk of wheat in a gale, and he knew he simply did not have the strength in his hands nor the leverage stretching behind him to saw all the way through. He wrenched the saw loose and flung it away from him. It clattered across the floor, leaving a bright smear of blood in its wake. Lask curled himself in the floor in front of the mirror, breath trembling to the rhythm of his body. “You need help,” Aleva said from the window. Lask knew she was right, but he had no one to call for. He considered the handful of spirits he had met during the three months he had been in the world. For moment, he considered calling for the Maculien of his vessel’s mother, but thought better of it. The task was great, and he was reluctant to trust non-Luminari to complete it in time. There was only one Luminara he had met since being drawn down. He would have to hope. He pulled his key from around his neck again, summoning a bit of his fire to make it glow red. He struck it against the floor, and sparks exploded from it. There was a clatter, and another key fell free of it, a plain gold shape. He picked it up and held it out to his familiar. Aleva flew to her master and took the key in her talons, then shot back out the window like a speeding arrow. Lask looked after her for a moment, then let his head fall back to the floor. He could feel blood running down his shoulders, dripping off as he shook. He wrapped his arms across his chest, and curled the ruins of his wings around himself, the last of his feathers lending him a dearth of warmth. His clouded eyes glanced toward the infirmary bed, but he simply did not have the strength to move. He closed his eyes, drifting into delirious haze of pain, fear, and hollow anguish. Visions of his attackers flashed in his mind, and made his broken body twitch and twinge. His breath shook as sweat stung his wounds. He could feel time passing, but he did not know if hours or minutes passed. At some point in the night, he heard a hawk’s cry outside. There was the sound of the door opening, and running footsteps. Hands pulled at him, gathering his head into the crook of a strong arm. His eyes cracked opened to see the rich brown face of Phena above him. “You came,” he whispered, voice raw. “Of course I came. I’m not going to leave you to die, dear heart.” He could feel her pulling at his arms. “We need to get you onto that bed.” She put his arm around her shoulders and braced her solid legs against the floor, hauling him up. Lask tried to help her, mustering his strength to push up with his own legs. They staggered across the floor, Phena practically carrying him, until he collapsed onto the bed, immediately staining the linens. Phena moved around the room, collecting the rags and instruments. “You’re sure this is the only way?” she asked him. “Just do it,” he beseeched her. Phena brushed his hair out of his face, and held his eyes for a moment. Seeing the look in them, she nodded, holding his face in her hand. She bent down and kissed his head, then moved around to stand beside the bed, taking up the knife. Lask’s breath escaped him in a ragged wheeze as the knife bit into his flesh. Phena wielded it well, and within seconds took up the saw. A raw scream was forced out of Lask’s lungs as she cut through the edge of his shoulder blade. He couldn’t stop the sound, though his throat felt as if it too were bloody. He felt blood pooling in the small of his back, trickling, soaking into the sheets against his sides. There was a heavy thump as the wing hit the floor. Lask buried his face in the bed, and sobbed, feeling Phena release a bolt of her fire to cauterize the gaping hole in his back. She put a hand on his shoulder. He gave a trembling nod, which turned into a gasp as she cut into him with the knife again. A low almost inhuman sound rolled out of him as she worked, and he didn’t even have the strength to clench his hands in the sheets. There was the sickening grate of the saw again, and she drew another cracking scream from him. He thought his throat would simply split open, but he could not stop the sound. Everything was a hot, crimson blur of agony, until he thought he would surely wink out of existence under the earthy brown hands of this Luminara. She stripped him to his soul with the stroke of the saw, and when the last of his wings fell to the floor, he wept with the hollow sound of a broken animal. Phena cauterized the wound, then packed it, pressing on it until the last of the bleeding stopped. He felt her grip his arm and pull. He didn’t have the strength to help her, or the presence of mind to understand what she wanted, but she managed to pull him up to sit anyway, kneeling beside the bed to brace herself against him to keep him upright. He sagged in her arms as she wrapped the bandages around him, binding the wounds tight. When she finished, she embraced him, and he sobbed freely into her shoulder. He managed to get his arms around her, and he clung to her as if she were the only solid thing in a world made of raging sea and wind. Phena held him against her, smoothing his hair, supporting him with her steady body until he quieted. She waved a hand at the bed, releasing a bout of her fire on to it, turning the sheets fresh and white once more, then guided him to lie down. He didn’t have the strength to reply, and only distantly heard the door as she went out. He didn’t know how long she was gone. He didn’t know if he slept. Everything was just a nebulous swirl of pain and loss and night. The first colors of dawn were beginning to filter through the window when Phena returned. She came to sit on the bed beside him. He felt her strong hand brush his hair back. Lask made a sound, but it wasn’t an answer. Phena tugged on his arm, and he groaned as the wounds pulled. She drew him back into a sitting position, then up. He swayed like a willow, and his legs would not hold him. Phena caught him before he could fall. His legs trailed under him as she supported him against her chest. She knelt, still supporting him, and pulled him over her shoulders. She summoned her strength and stood, hefting him with her. She carried him across her shoulders as a shepherd would carry a lamb, and she moved out of the infirmary into the forest beyond. It was a long way to the east end of the island, and there were no paths. Lask had never needed any. Phena carried him through the trees as the sun rose, and they passed in and out of the streaming dawnlight. She plodded toward the light with him, and he knew nothing but the feel of her steps beneath him, the exhausted pain of his body, and the growing warmth of the sun. He only registered more when the sound of her steps changed. She stood on rock, picking her way down into the shadows where the sun could not reach. She summoned her fire, and he felt it on her hands that gripped him. It did not burn him; its warmth was comforting. She descended into the stony deep like a living torch, lighting their way. Lask could smell salt, and the air began to dampen with steam. There was a splash, then another, then he felt hot water against his skin. Phena waded into the spring, and carefully deposited him on a ledge in the water. She cast some of her fire up to burn like lamps on the edges of the pool, then reached for him, working loose all the bandages he had tied, and the ones she had placed on him, baring his wounds to the saltwater. He gasped and winced as it stung. “I’ll be fine.” His voice could not rise above a hoarse whisper. She nodded, cupping his face to study him, as if to reassure herself he could manage, then waded back to the edge of the pool. She drew a door for herself in the air back to Belvale, then was gone. Lask sat in the water, the salt both stinging and soothing. He thought the warmth of the water was the most comforting thing he’d ever felt in his life. As he sat there, he reached for his vessel in his mind. She was but an infant and could not understand what had happened to him. He could feel her distress and tried to soothe her, taking comfort in her tiny lifeforce tied to his. He could feel some measure of strength returning to him as he soaked in the pool. It was as if the water were life itself, and it permeated into wounds. When Phena returned, she carried a large urn. Wading back into the pool, she tilted it, water pouring from its mouth, until a large fish passed out of it and into the hot spring. It was nearly as long as her arm, and had fins that drifted around it like silk scarves. Magic wisped from its body as it circled, acclimating to its new home, then Phena motioned it toward Lask. The fish approached him, and Lask slid off the ledge to meet it. For a moment he wondered if he would be able to stand, but the water helped support him, and though he swayed, he did not sink under. The fish swam to him, circling him, brushing him with its fins. As it touch him, he felt its healing magic flow into him, closing his wounds. Phena nodded and reached up to cup his face in her hand. Lask bowed his head, feeling tears threatening to return, but holding them back. “Thank you,” Lask said again, finding he had no more words.